I have been waiting for a letter from you so long that I have got out of heart of ever hearing from you all any more. I want to hear from you all very bad. None of us are very well at present but are all up and about. I don’t know if I can write any thing new that will be of much interest. There is nothing thought or talked of about here but the war. All of the boys seventeen years of age are gone from this settlement. They went last Thursday week. Dan Eddinger and David and Joe Clodfelter and George Waggoner’s sons are all gone and a great many more had to go. 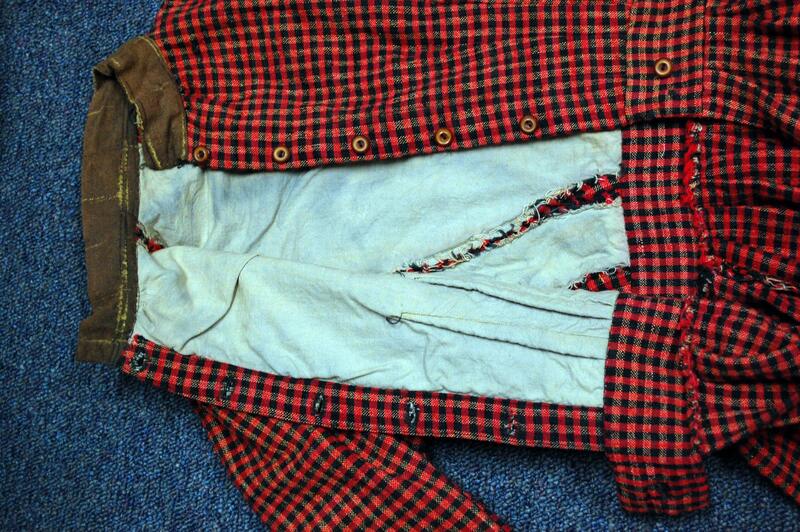 They took Sam Darr without anything but what he had on. It seems like times get wrose all the time. I never expect to see any better times but if I live long I expect to see everything destroyed by the Yankees. You may not think this will not be so but if you live you will find it to be so. Solomon Clodfelter’s son is killed. Bryant wrote in his letter that John Mock had one arm off and to day we heard that he is dead. Barna Leonard went off to the army and died in a few weeks. Little Adam Sink died with the Yankees. We understand that Joe Sink is wounded in the wrist. Now I have told you all I know about the war. The people of this settlement are generally healthy. The small pox is among the negroes below town. Henderson has put up a stand for preaching down here on the road where the road turns off to go to Sowers. Jackson and Hamner are to preach there this summer. I suppose you have heard that our preacher has left and gone to the yankees. Preacher Seinn got killed by falling from his mule on his way home from church. The mule kiceked in the head and killed him dead. We have had a great deal of rain. It rains here nearly every day. Some people in the settlement are suffering for something to eat now. Phillip is at home yet. I do hope that he is and will stay there some of you must try to come and see us if you can. If Phillip stays at home get him to bring you and the girls down sometime this summer. Alpheus is gone to see Laura’s baby today. It can sit alone. May Ann, if I could see you I could tell you several things that I don’t want to write. Gust Bryant visited some of the soldiers wives a good many times when he was at home last. He paid his visits to one that lives not far from the creek. I must tell you how cheap spun cotton sells. It is fifty dollars per bunch. Wheat and corn is about eighteen or twenty dollars per bushel and very little to have at that. Iron sells from three to five dollars per pound. I reckon you will all be tired of my lterrers. I must think of coming to a close. We received your letter of the 15th ult., communicating the sad news of the disease of your amiable and respected mother. We all deeply sympathize with you and the family in this bereavement and hope that the Great Disposer of all earthly events will give you and all grace and fortitude to withstand this, to you, afflicting dispensation of his Providence. Although comparatively a stranger to your mother, I had from my first acquaintance, learned to revere and to love her for her purity of character, her gently and amiable disposition and her true Christian piety. I can well imagine that the loss of such a mother would cause the sorest affliction to her relatives, but you will have the consolation that her spirit is sweetly resting in heavenly bliss, freed from the cares, anxieties and sufferings of this life. I shall ever remember your mother with feelings of reverence and admiration. Our friends and acquaintances, one by one, are, in fact, dropping off. Old aunt Polly DeBerry died last Sunday morning. She has been afflicted for the last few weeks her disease has seemed to fasten on her with a tighter grasp when dead ended the scene. Ann is gone down to Mr. Ewings to see Fanny. She went last Tuesday and was to have returned today, but there was a heavy rain last night & this morning which has raised the river, and I shall not look for her until tomorrow or the next day. I showed your letter to Fanny and she said she would write you. Kezia wrote you, I think, last week. I would be very glad to hear from you as often as may be convenient and glader still, if you could pay us a visit and spend some time with us. Write soon. Source: Christopher Watford, ed. The Civil War in North Carolina: Soldiers’ and Civilians’ Letters and Diaries, 1861-1865, Volume 1. Original in the Branson Family Papers, North Carolina State Archives. 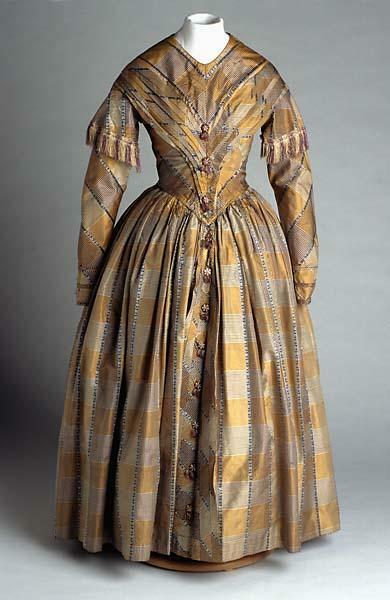 Second-day dress, blue and amber plaid taffeta trimmed with fringe and silk covered buttons with tassels. 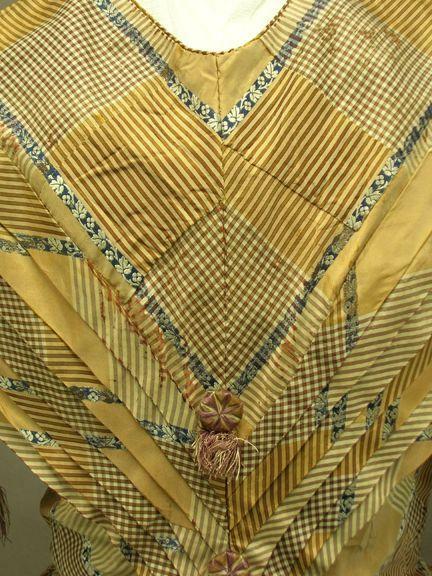 Worn by Laura Battle Phillips in Chapel Hill, Orange County, North Carolina after her marriage to Charles Phillips in Chapel Hill, December 8, 1847. Made in Philadelphia. 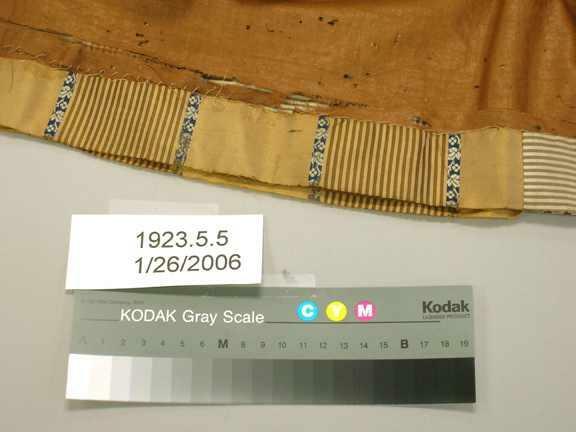 Source: Collections of the NC Museum of History, accession number 1923.5.5. Search our collections here. 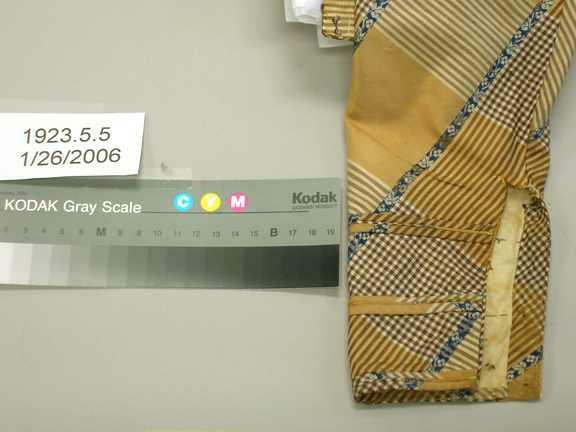 We see it stated “that the State clothing Department has advanced the prices paid the worthy sewing women who make up the clothing for our soldiers.” The prices now paid are as follows: Coats, $1.50, pants 1.25, shirts 75, and drawers 50 cents. So that now, by working hard three days, these “worthy women” can make enough to buy them food for one whole day. The present Legislature should make an appropriation to buy Coffins for these “worthy sewing women,” who may freeze or starve to death this winter on the advanced rates of labor. In this morning’s post Catherine Edmondston laments the fact that she is having to make her own fabric for her dresses and her husband’s clothes too. 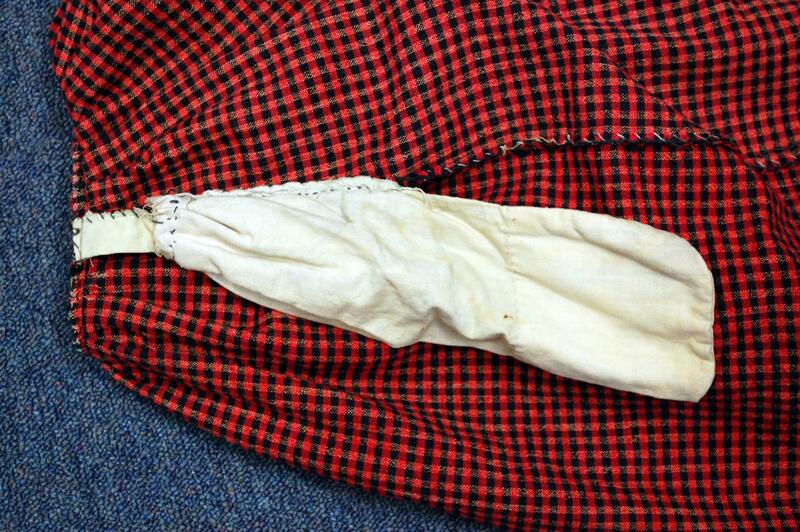 Throughout the war, women of North Carolina re-learned the skills of spinning and weaving to make their own clothes where they were able to purchase ready-made fabrics before. 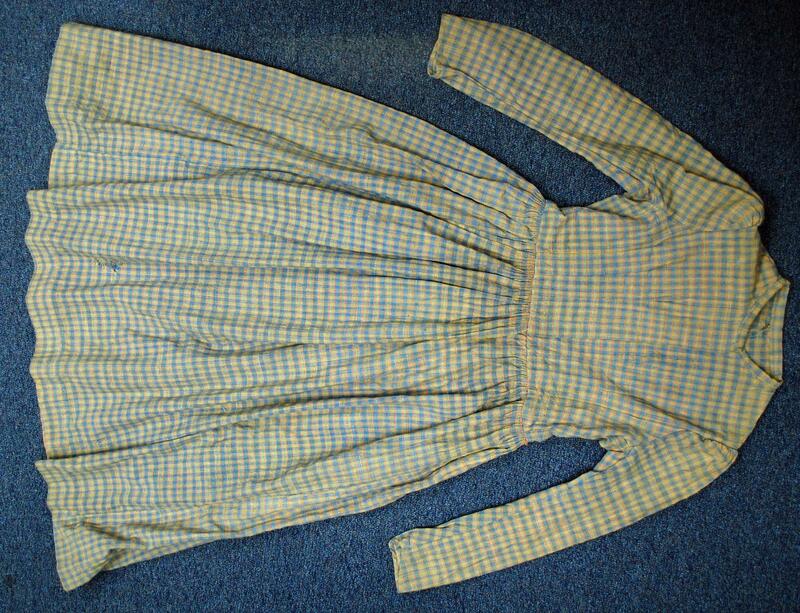 The dress below, although dated to 1886, represents the same type of homespun being made by North Carolina women. 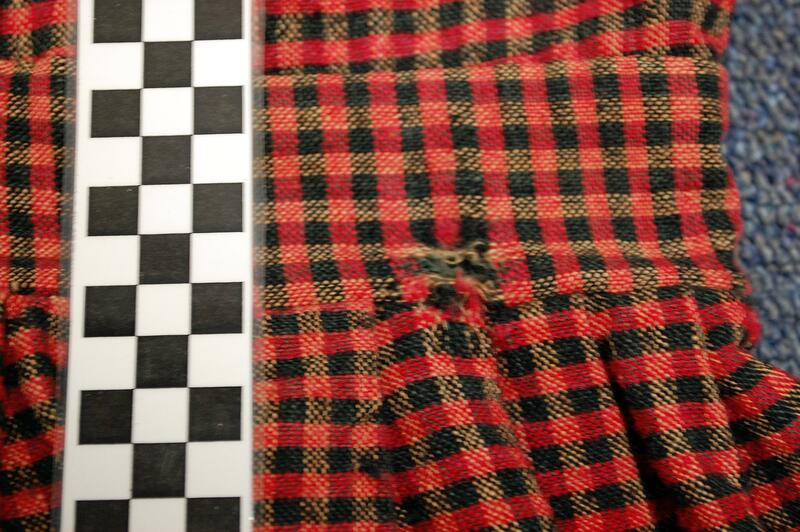 Its pieced skirt also demonstrates creative use of fabric in “unseen” areas. 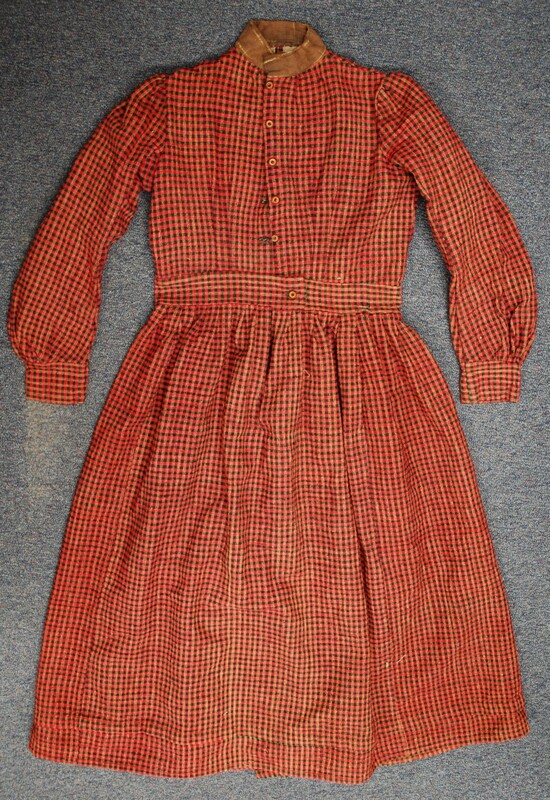 This dress was made by Elizabeth Baity Reavis for her daughter Molly’s second day dress. Molly (Mary Elizabeth) was born June 28, 1869 and was married on October 21, 1886. 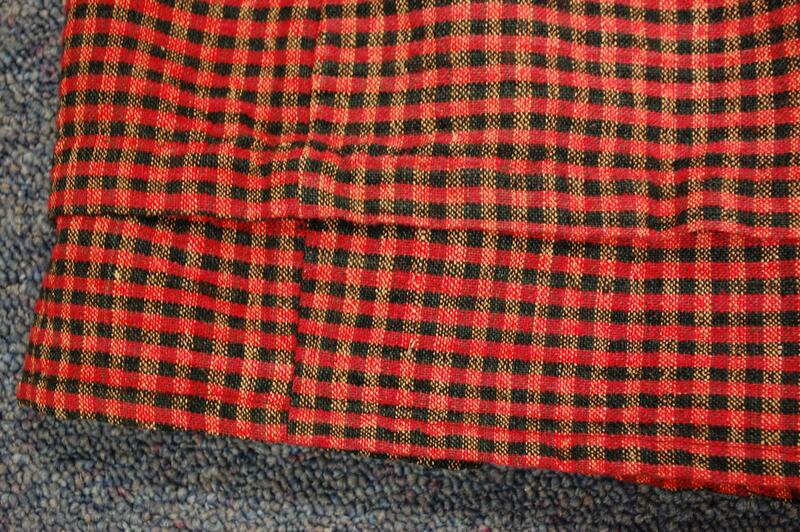 Woven black and red check dress of cotton and wool. 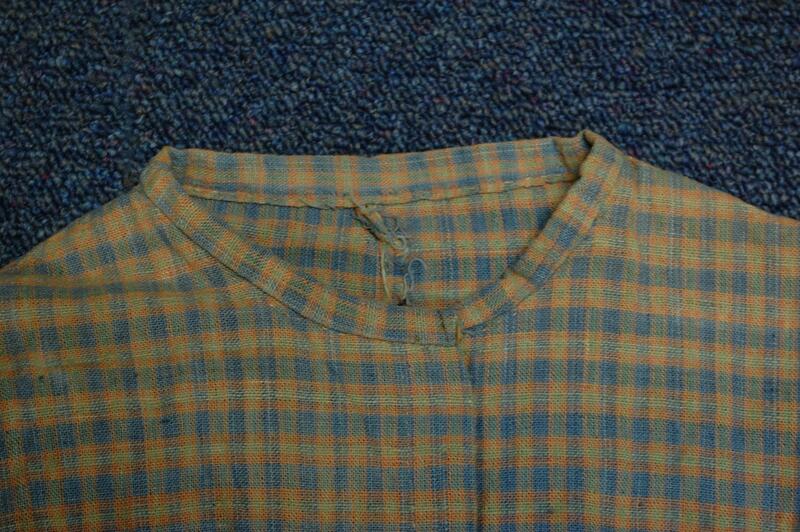 Lined bodice, with brown standup collar. 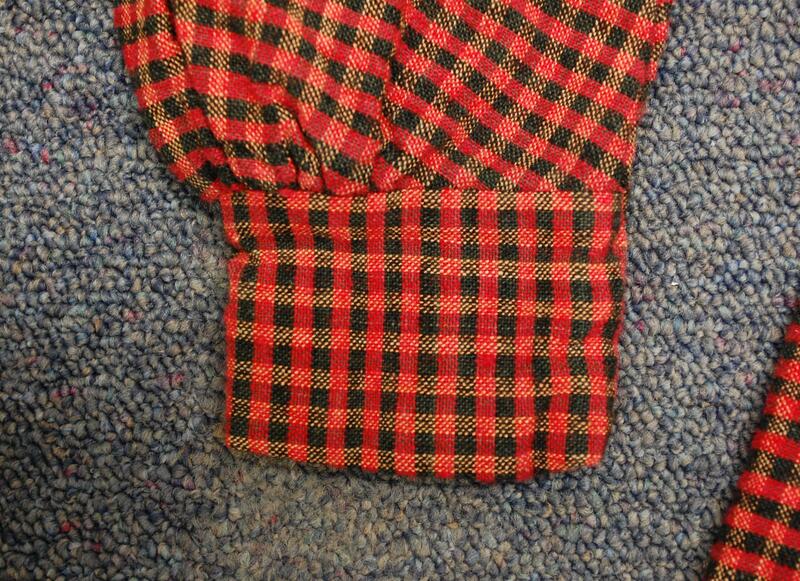 Set in sleeves have wide cuffs. 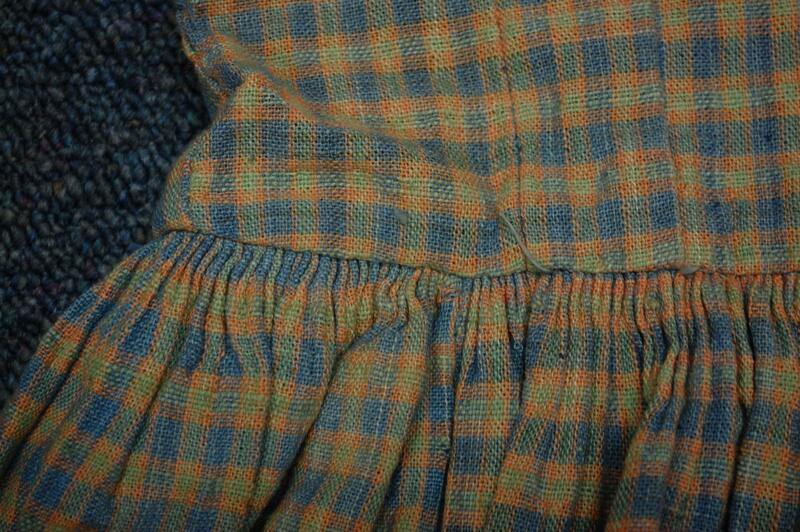 Skirt is pleated to waistband and has a set in pocket. The dress features a rolled hem and a large tuck near the hem to shorten the skirt. 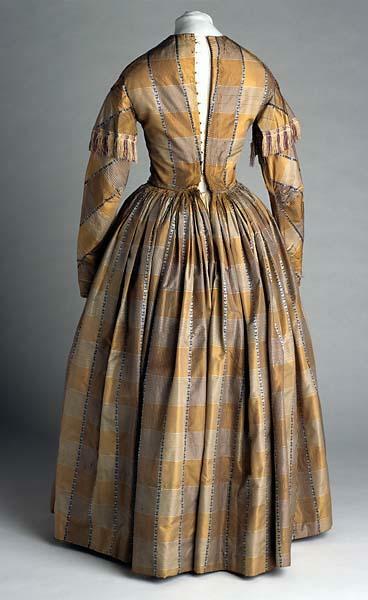 This dress is related to dress featured in this blog post as they came from the same donor family and are both attributed to ca. 1860. Collections of the Department of Cultural Resources can be searched online here! 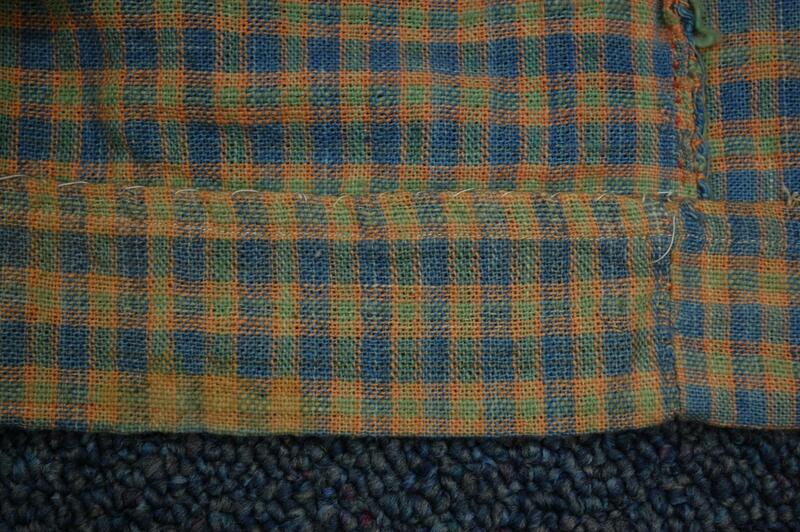 Loosely woven in blue, green, and peach. 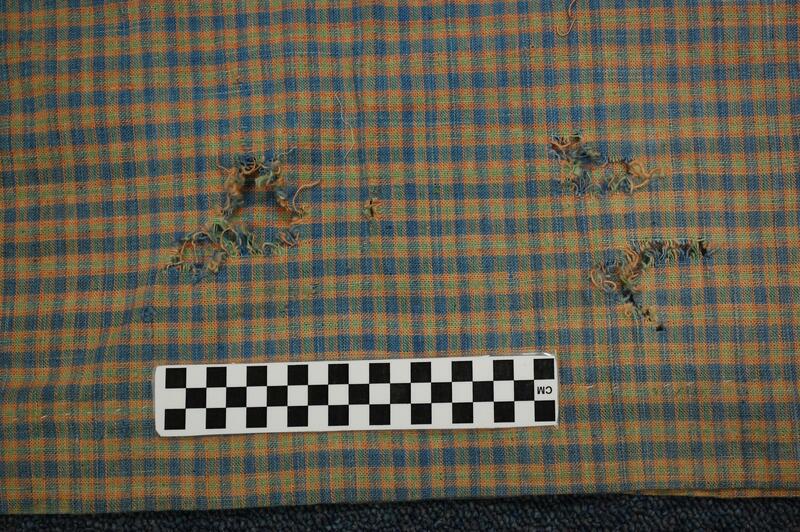 Handsewn throughout. Center closure at bodice originally with hooks and eyes. 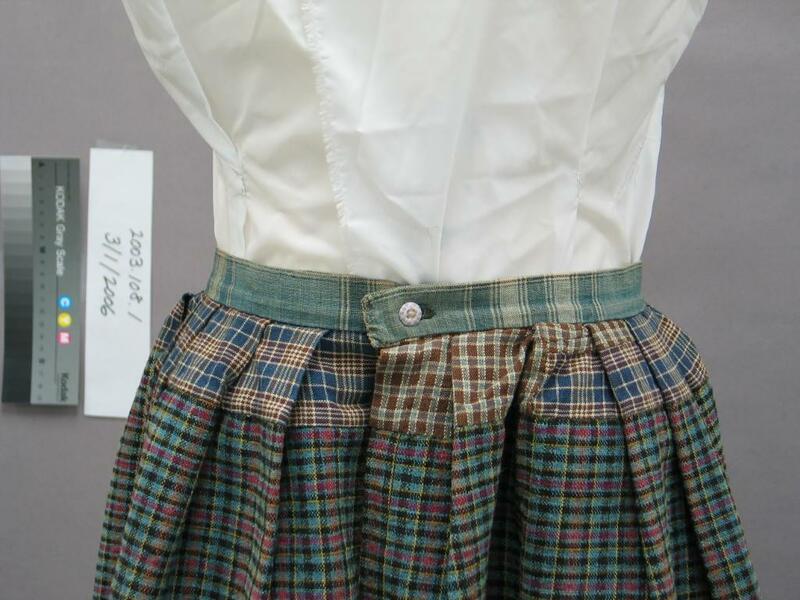 Three panel skirt is gauged with a two inch hem. 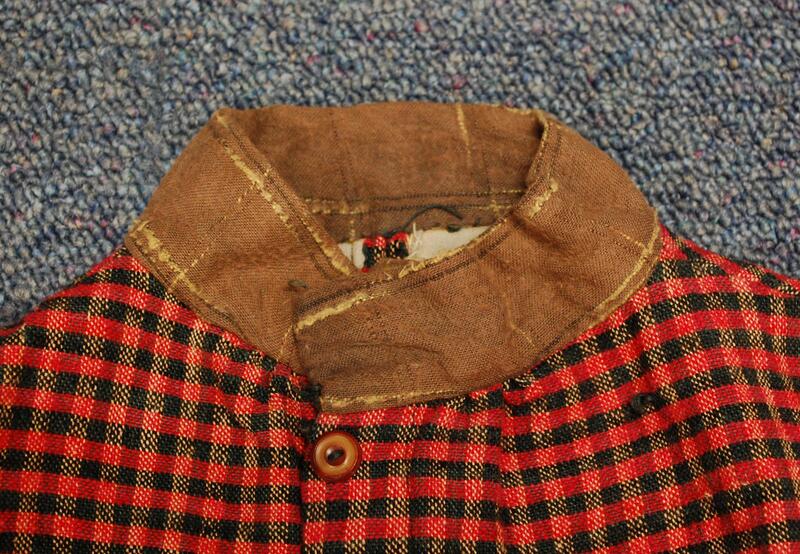 Plaid dress, detail. Collections of NC State Historic Sites. 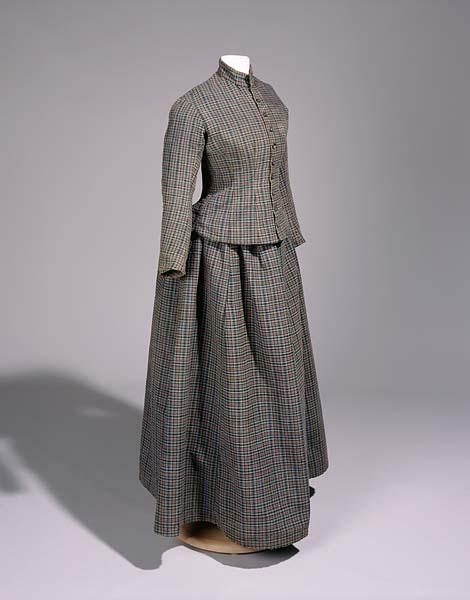 As resources became stretched thin by 1863, women of North Carolina were spinning, weaving, and sewing their own clothes. 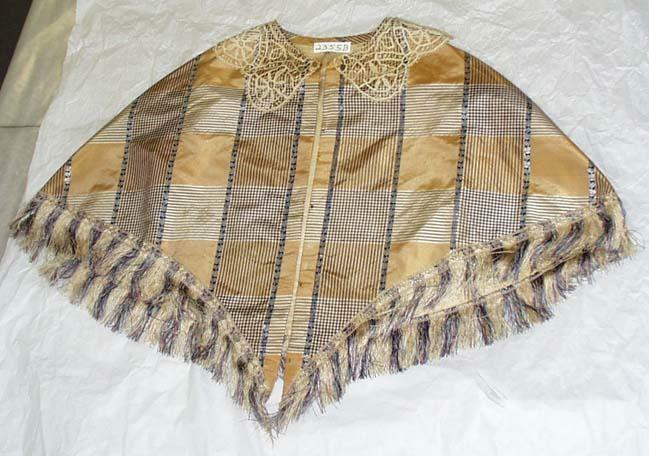 Several instances of “homespun” have already been seen in our posts from Cornelia Henry, Catherine Edmondston, and in other museum pieces.